It's World Interiors Day on 28th May 2016 and Asian Paints invited a few bloggers to their Colours store in Mumbai. The colours store is a beautiful place that you definitely must explore if you're redoing your home (if you're a creative person, you can visit nonetheless). Read more about the store here. We had Ruchi Gupte, a production designer from the industry, as our guest speaker for the day. She's worked on movies like Taare Zameen Par, Aisha, Khoobsurat, Lunchbox etc. She enlightened us with the theme for this year's World Interiors Day I.e. Intelligence in interiors. It's very apt, since everyone wants the use of technology everywhere. She started off by telling us about all the thought, homework and research that goes behind creating each set and different scenes in a movie. Did you know that the props and sets are inspired by the characters personality traits and back story. They pick some personality traits of the character (and not the actor) and make a colour palette for them and apply in their sets, clothing, accessories etc. For instance, Sonam Kapoor with whom she's happened to do two films, goes well with purple and variants like lilac. 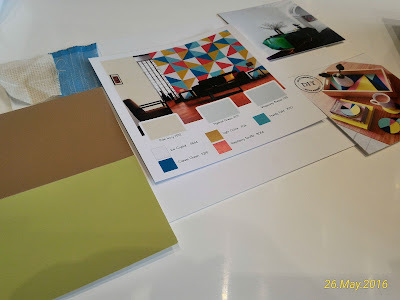 She also told us how they make sure each room has a totally different paint colour to make them look entirely different. Otherwise, usually in our homes we have the same or similar colours in every room. On this note, she did tell us that we're the characters or heroes of our own life. Infact they get inspired by real life homes and people all the time, for their movies. She also gave a quick tip that throw out all the horrible white lights that make your dark circles look worse, and invest in yellow lighting that make colours look beautiful and add warmth to the house. After this, there was a quick session where different boxes contained furniture, wall, colour, fabric inspirations and we had to select what we like and put together a mood board. For the living room I went with geometrical shapes which are quite contemporary. As far as the colour goes, I kept it neutral to genders as the living room is a space for everyone! Once my new home is ready, I just cannot wait to get on with the painting and decor part of it. There were some snacks and we were sent off with a goodie bag that had DIY wall art. I got an Eiffel Tower themed one and I cannot wait to try my hands on painting it! Will update it on the blog once it's done. Thank you Asian Paints, for having us over. Since its foundation in 1942, Asian Paints has come a long way to become India’s largest and Asia’s third largest paint company, with a turnover of Rs. 141.83 billion. Asian Paints operates in 19 countries and has 26 paint manufacturing facilities in the world servicing consumers in over 65 countries. Asian Paints has always been a leader in the paint industry, pushing new concepts in India like Colour Idea Stores, Ezycolour services like Home Solutions & Colour Consultancy and Colour Next trend forecasting. In a country like India, vastu services is considered one of the basic requirements while constructing a property or building according to pre-specified principles. It is necessary to follow these principles for wealth, health, fame and prosperity in life. Though it has become difficult to follow each and every principle in the present era, it is important to make maximum use of tenets in order to achieve peace and harmony in life.